And that’s why I’ve been mostly absent. But here’s a teaser pic from the vacation gallery that I don’t have up yet. 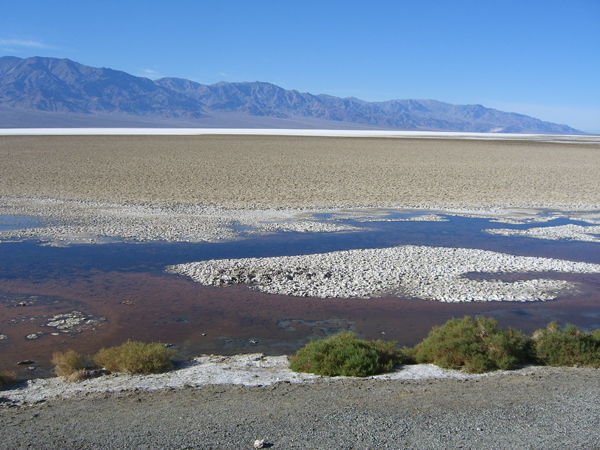 This is a place in Death Valley called Badwater. It’s the lowest point in the western hemisphere, being 282 feet below sea level. The water isn’t potable, but very rare snails and little guppies live in it. The white band out in the distance is a dried lake bed. The white is salt and alkali. And, yes, the sky really was that blue. Click the pic for the bigger version. In knitting news, I’ve progressed a small way up the ankles of the Lorna’s Laces socks. There hasn’t been a lot of knitting time, unfortunately, but I still hope to have these finished fairly soon. And then I’ll have something to put in the 2006 finished objects gallery! In techie news, I’m working on an update of PI to the latest WordPress version (2.0). It’s not yet ready for prime time, as I’m having problems with a plug-in that I need to have working. Hopefully that will be resolved in the next week or so. Then, if all goes as planned… you won’t notice anything.